Long day, short night was the start to this little adventure which took in three Scandinavian countries and St Petersburg in five days. Having now been to Russia on two occasions, I do at least feel able to scratch off this vast area on my map given to me by my well-meaning colleague. Sweden and Denmark have also been erased. But, yes, it was a long start to the trip. In work at 8am and finally at the Park Inn at Stockholm Airport at 1am the following day. It was a good day and an easy journey from Swindon to Heathrow’s Terminal 5 which is a terminal I like. Well, other than a security man who I tolerated better than he did me. Surely, we have a right to a modicum of civility but I guess the odd one slips through the net, sadly. The British Airways flight was very slightly delayed but was pleasant and made better by a crew member whose good temper when bombarded by requests for second rounds of drink by many, myself included, was noticeable. On arrival, the Park Inn was very helpful in sending a bus to collect me although their services had closed for the day but, nonetheless, I was pleased to finally get to bed at 1.30am. 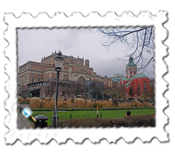 The idea of this trip had been founded on my previous visit to Helsinki earlier in the year. 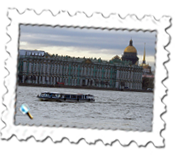 A sign jumped out at me offering cruises to St Petersburg without the need for a visa which was attractive as it was a city I had long wanted to see. 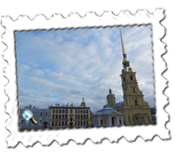 So, booked early, I paid a mere 145 euros for a return cruise in a two-berth cabin to myself and the return bus ticket to and from the St Petersburg harbour which gets around the need for a visa. I suspect the price of the visa would be the same as I paid for the cruise and, no, I paid the going rate. Rather than just fly to Helsinki to take the ship, I took the opportunity of having a stopover in Stockholm on the outbound journey and Copenhagen on the inbound. The proverbial whistle-stop for sure but I’m never happier than when I’m seeing new places so it was an enticing prospect. 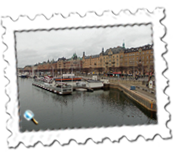 Stockholm was pleasant and I covered as many of the sights in the three and a half hours I could afford. 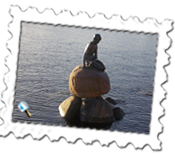 It is quite a large, sprawling place on a number of islands and was one of the Scandinavian capitals which I was very keen to see. I wasn't disappointed but had to get back to fly to Helsinki late afternoon. Having booked the flights several months in advance, it was a bit of an inconvenience when a flight schedule change by over three hours resulted in me having to ask SAS to go the previous day to Helsinki - where I would board the ship - as the flight change made it too tight for comfort. A wise choice as the subsequent departure time of the ship was moved an hour earlier. I had a number of choices of hotels for Helsinki and, for no particular reason, selected the Rantasipi Airport Hotel and it turned out to be an excellent choice. Decent food, friendly staff, a sauna and, being an airport hotel, many images of aircraft, old and new. I didn't have to leave until almost midday the following day and managed to find the same port from which I sailed earlier in the year to Tallinn a little more easily. My sense of direction in Helsinki over Easter had been woeful in the extreme so I set out with little confidence but did make it. As luck would have it, the winds were high and I had been sent on my way with sea sickness pills remembering the miserable journey also earlier in the year from the Lofoten Islands to Bodo when I had spent most of the journey curled up in the loo but, mercifully for me this time, the winds abated and everything was fine. 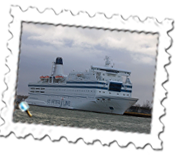 St Peter Line's Princess Maria proved to be a lovely experience. Granted, I had paid for the most basic cabin but it was roomier than I had imagined, was comfortable and had a bathroom also. There was plenty to do on the ship: plenty of bars and restaurants ranging from the budget to more expensive thus suiting all budgets, cinemas and gambling outlets and a walk outside was bracing and invigorating. Being a Russian ship, duty free prices were very attractive but only available for a limited time period based on Moscow time. The qualification for going into Russia without a visa was buying a tour which, put loosely, was a 25 euro return trip in a minibus. I had long wanted to visit St Petersburg and this proved to be the best way of doing it. 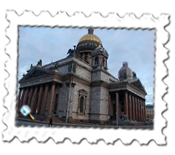 Okay, it meant just a few hours there so I concentrated on the main cultural highlights of St Isaac's Cathedral, the Hermitage and Peter and Paul Fortress. All can be visited by foot easily - well, the only difficulty with this was the unruly traffic which, at times, verged on the frightening as they seemed to have no regard for pedestrian crossings. Traffic lights could also take an age to change - and so, like Stockholm and later Copenhagen, I had plenty of exercise and fresh air. It was a shame that the Hermitage, the State Museum, is closed on Mondays, the day I was there, but never mind. It is a most impressive building as is the general staff building opposite. 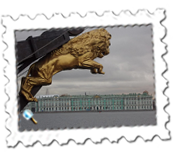 The Palace Embankment along the River Neva is enchanting as is the whole stretch of water along which most of the highlights are situated. St Isaac's dominates the otherwise low-rise buildings. 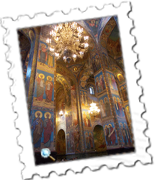 I did pay to go into the highly distinctive Church of the Savior on Spilled Blood, built on the site of the assassination of Tsar Alexander II and based on Christ's resurrection. The colourful mosaics inside are remarkable. Peter and Paul Fortress with its high spire dominates the other side of the river and, on the same island, is the Trubetskoy Bastion, a prison for political prisoners. There is even a small area of beach on the island with fine views of the Palace Embankment. Like Stockholm, St Petersburg was not a place I found easy to photograph with plenty of sea and sky dwarfing the many fine buildings. Not everything went entirely straight forwardly towards the end. Having taken the St Peter Line minibus back, I was bombarded with a stream of Russian invective – you might say that I got the gist despite not understanding a word – by the driver as I’d apparently tried to open the door too violently either to get in or out and had ,well, b******d it so was ordered to climb out of the back. I remain unconvinced, the door being too strong to open manually due to its, as I discovered later, automatic opening but it may have explained why the only two other passengers were put in the front. Anyway, safely ensconced on the ship, I had a chuckle. Not for long, though, as my usual ritual of checking my money in the sanctuary of the cabin having made the odd purchase found me 100 Danish Kroner down but 100 Roubles up. Whoops, this left me out of pocket by around £10 having given someone somewhere – and I can assure you there were only three places – the wrong note. This routine, I should also add, is done in secrecy as I am aware it makes Fagin look like a philanthropist. Back on time in Helsinki, I did have quite a bit of time to kill some of it being taken care of being hauled in by customs and questioned about my duty-free products but I was soon safely on my way. I flew on to Copenhagen in the afternoon and stayed by the main railway station. I only had the rest of the evening and the following morning to see as much as I could and, in the evening, it turned out to be very little. 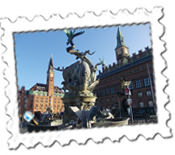 I had found a nice restaurant offering a three course buffet for just £10: excellent value for Scandinavia although there seemed to be ample places in Copenhagen generally where you could find a decent and not particularly expensive meal. God knows what happened after my meal but, needless to say, I went round in circles, saw the same restaurant three times and gave up when I eventually found the hotel. In the light of the following morning, I did a lot better and saw most of the main sights. My free city map, which looked impressive but which the previous night never seemed to have the names of the streets I ended up in whilst hopelessly lost, took me through the amusement park of Tivoli, the quaint, colourful and much-photographed Nyhaven, Christiansborg and Amalienborg Palaces and, out of the immediate centre, one of Copenhagen's most famous tourist attractions, The Little Mermaid. Somehow, I managed to pull something in my ankle which a sauna in DGI Byen's failed to ease and which got progressively worse at Copenhagen Airport. Back at Heathrow, however, after the two hour British Airways flight with a small bottle of red wine, I got gingerly up to find that, far from being worse, I was almost completely better. So, there you have it: I like to believe that red wine has got properties for the heart but it must also do wonders for ankles also... Nothing more needs to be said about the duty free London Gin which well and truly healed it!